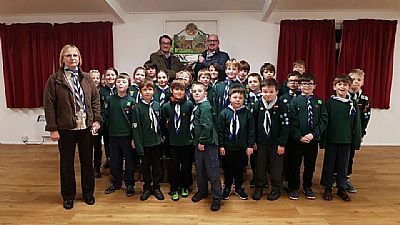 The Cub Scout section was recently presented with a cheque for £165 from Jeremy Cole as part of a fundraising initiative in partnership with Agricole Heating Oil. The Scouts delivered leaflets to houses in Bourn last month promoting this fundraising initiative. If a residents orders 750 litres over a year then the company will make a donation to the Scout Group. Unfortunately the wrong leaflets were delivered which gave the impression that funds were being raised for Comberton Scouts. This was incorrect. Rest assured that, if you did order your oil supplies, it is/was Bourn Scouts who received the donation. These additional funds arte invaluable to ensure that the whole Scout Group can have the right resources for activities throughout the year. Next up is Easter Camp.